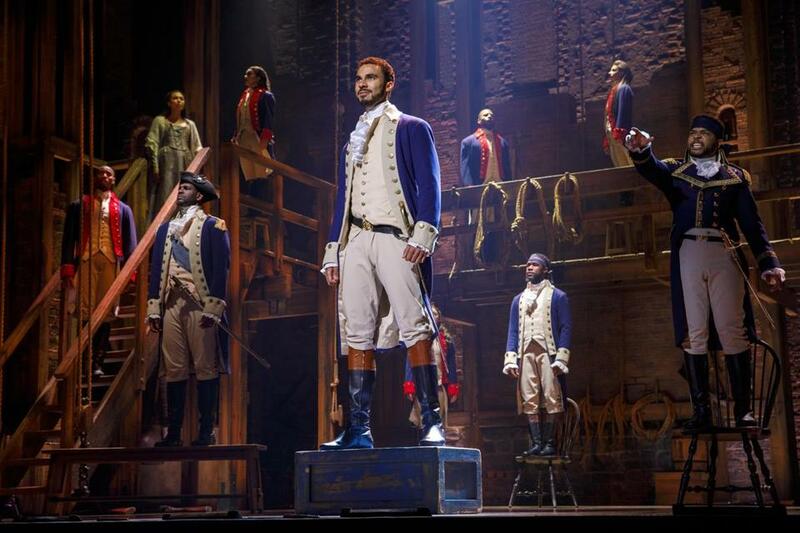 The “Hamilton” touring production, now at the Boston Opera House. Lin-Manuel Miranda has been justly celebrated for the monumental achievement that is “Hamilton,’’ having written the music, lyrics, and book for his landmark bio-musical about Alexander Hamilton and the Founding Fathers, not to mention playing the title role for a year and a half off and on Broadway. But the touring production that has arrived at the Boston Opera House — which, by the way, is exhilaratingly good — stands as a useful reminder that for all the ways in which “Hamilton’’ is singular, it shares one attribute with every musical ever made: It’s a group effort. Yes, one marvels at the sheer scope of “Hamilton,’’ how much story Miranda packs into it, how he generates an onrushing, near-Dickensian narrative momentum even as he frequently shifts moods and tones (and occasionally stumbles with a wince-inducing rhyme). Yes, one is struck anew by how many indelible, character-illuminating songs Miranda has composed and how wide a range of idioms his musical palette encompasses. Yes, it’s intriguing to contemplate the parallels between the restless, ambitious artist and his restless, ambitious subject, Miranda and Hamilton each pushing his talents to the limits, each determined to fulfill his potential, each discovering the extent of his creative capacities in the process. But solitary geniuses don’t get very far in politics, war, or theater. In order to realize his vision, Miranda made the astute choice to reunite with several key collaborators from “In the Heights,’’ his breakthrough 2008 musical, and the dividends from that choice are apparent for all to see and hear on the Opera House stage. When it comes to making “Hamilton’’ soar to its own heights, the contributions of director Thomas Kail, choreographer Andy Blankenbuehler, and music supervisor/orchestrator Alex Lacamoire are absolutely vital. With its combination of swirling fluidity and clockwork precision, Blankenbuehler’s choreography consistently delights the eye while moving the story forward. Kail ensures that the scenes of combat sizzle in “Hamilton,’’ whether of the kind involving shot and shell or the kind involving words (such as a rap battle between Hamilton and Thomas Jefferson). The talents of the creative team yield a coup de theatre midway through Act 1, the dazzling, time-hopping “Satisfied,’’ in which a wedding scene flashes back to a pivotal moment in the life of Hamilton and the two sisters, Angelica and Eliza Schuyler, who loved him; and then again in Act 2’s “The Room Where It Happens,’’ in which Aaron Burr experiences the bitter taste of exclusion while Hamilton makes history behind closed doors; and yet again in the climactic, slow-motion duel between Hamilton and Burr. The quality of this touring production serves notice, in case anyone was wondering, that “Hamilton’’ is built to last. Because it is fundamentally an ensemble piece (and the touring production boasts one heck of an ensemble), it’s not reliant on any individual star or constellation of lead performers to succeed. While working within the general template of the original Broadway performances, cast members bring their own interpretive nuances to their roles. Austin Scott, who plays Hamilton, is a less overtly expressive actor than Miranda but a markedly better singer. Moreover, he possesses the carriage of a born leading man. When Scott’s Hamilton says, “There’s a million things I haven’t done,’’ he projects a confidence that it is his destiny to eventually do every one of them. Nicholas Christopher adroitly traverses the emotional spectrum as Burr, a role as crucial to “Hamilton’’ as Judas is to “Jesus Christ Superstar.’’ Christopher’s Burr evolves from smooth, above-the-fray self-assurance, condescendingly instructing 19-year-old Hamilton to “Talk less. Smile more,’’ to the thwarted humiliation of a man who has experienced the eclipse of his own fortunes while forced to watch Hamilton’s rise from a front-row seat. Hannah Cruz is a warm, graceful Eliza; Cruz makes you ache for Eliza in her grief, losing first her son, then her husband. Sabrina Sloan captures the quicksilver intelligence and fiery spirit of her sister, Angelica. Sloan is deeply moving when, in “Satisfied,’’ Angelica fully confronts her regret — which she knows will last a lifetime — over stepping aside and surrendering Hamilton to Eliza. Bryson Bruce brings a fast-talking farceur’s celerity to the dual roles of Jefferson and the Marquis de Lafayette, while Peter Matthew Smith is a loopy treat each time he makes an appearance as a robed, crown-wearing King George, menacingly crooning “You’ll Be Back’’ to the runaway colonies. Paul Oakley Stovall’s performance as George Washington is large in every sense: Stovall’s Washington is a commander others would unhesitatingly follow. That the father of our country is played by a black man is no small thing. “Hamilton’’ has been that rare stage production to occupy the center of the cultural conversation, illustrating the power of an innovative artist to put a new frame around familiar personages and events while proving that musical theater can resonate not just as popular entertainment a la “The Book of Mormon’’ or “The Producers,’’ but in the realm of ideas. By casting performers of color as the key figures of the American Revolution, putting them in the forefront of the national origin story, “Hamilton’’ reminds us that both the story and the nation belong to everyone.